Big pool toys, like pool noodles and other floaties, can be tough to store because they take up a lot of space and don't really collapse well. Keep yours organised this summer with a plastic hamper — they're cheap, and big enough to hold everything. You want a hamper that has holes for drainage, and of course, one that's at least half as tall as the pool noodles (so it won't topple over). If you throw in your other pool toys, like inflatable balls or weighted rings, you can just carry the whole hamper to the pool when it's time to go swimming. 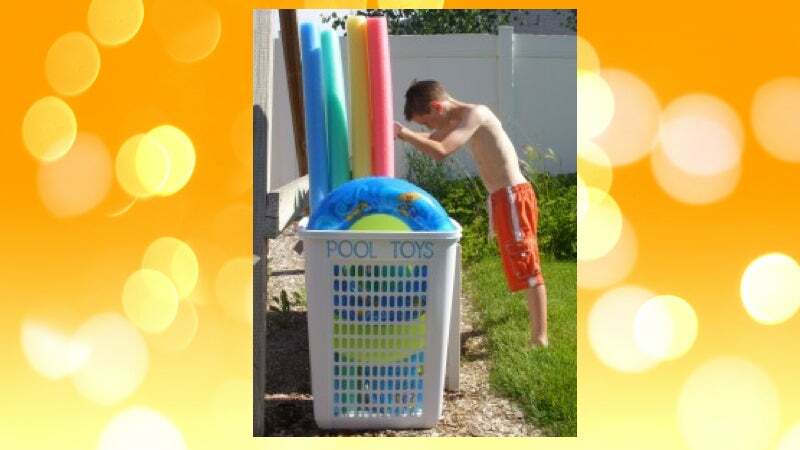 The hamper also gives your kids one spot that all the pool toys belong so they don't leave them laying around. Since the sun and chlorine from the pool water will wear on the plastic over time, get an inexpensive hamper that you don't mind replacing.